than the lighter colors and will be more durable over the life of the cookware. Specifically for Gas, Electric, Halogen, Ceramic, or Induction Cook Tops. Designed specifically for Boats and RVs. 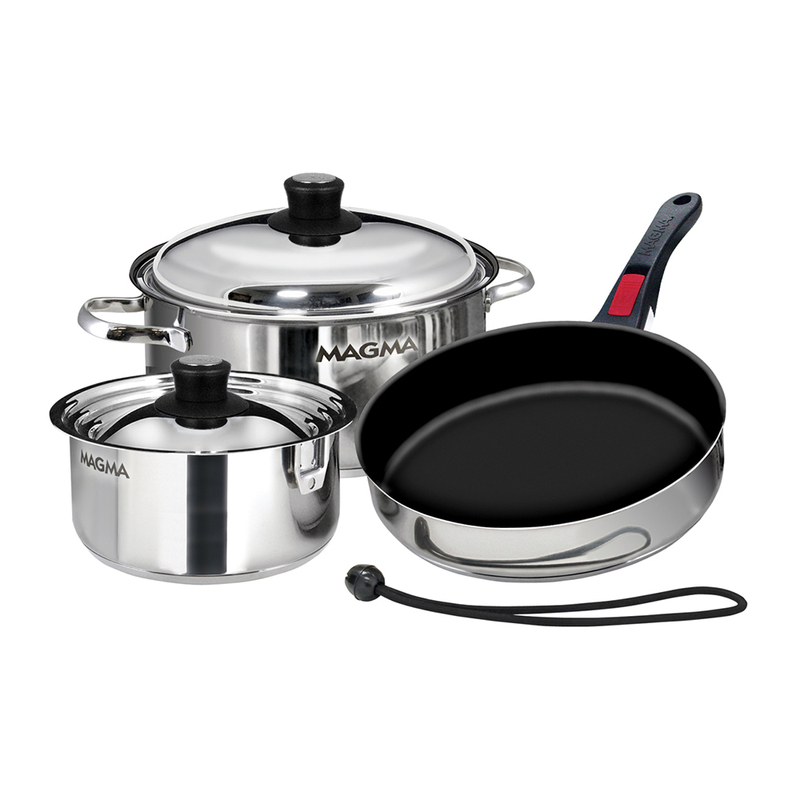 Made of 18-10 mirror polished Stainless Steel, Magma's Award-Winning, cookware sets are now available with Ceramica® Non-Stick coating for use with Induction cooking systems. Sets completely nest and store in less than 1/2 cu. ft. of cabinet space. The Heavy Duty Non-Toxic, PFOA, and PTFE free, Slate Black, Ceramica® non-stick is remarkably easy to clean, will not stain, peel, blister, and nothing sticks to it...Nothing! The encapsulated Triple-Clad bottoms (Stainless Steel, Aluminum, and Magnetic Stainless Steel) are milled perfectly flat for superior even heat distribution. The Triple-Clad bottoms outer layer uses the highest quality ferromagnetic stainless steel, specifically used to activate the magnetic field in all Induction cooking surfaces. Cookware is oven safe to 500° F (excluding removable handle). Magma cookware has been selected for Practical Sailor Magazine's Gear of the Year & Editor's Choice awards and a recipient of the Good Sam's Club Product of the Month award. Encapsulated Tri-Clad bottoms (Stainless Steel, Aluminum, and Magnetic Stainless Steel) for perfect heat distribution.